BoDream News/ Outrunning a Storm! Sorry that my recent updates have been short and few in number. In the midst of taking advantage of an easterly wind to get me clear of the notorious Bay of Biscay and on towards the equally challenging Cape Finisterre, this easterly wind came with warnings of a very strong wind front forecast to reach Cape Finisterre at approximately the same time as Bodacious Dream. It became imperative then that I move as quickly as possible towards Cape Finisterre, and try to round it before the winds arrived. The first two days out of La Rochelle would have been “champagne sailing” any other time, but for this urgent need to make haste, and to use every option available to do so. As you can imagine, when you are focused on something as specific as hitting a time target 60 hours in the future, you forget to look around and realize how nice the sailing is. It was indeed beautiful…warm – nearly clear skies but light winds. I had to remind myself a number of times just how lucky I was to be there. I hadn’t made any mention of the strong winds at Cape Finisterre, because I didn’t want to alarm anyone, but the forecasts were calling for winds accelerating north and west of the Cape at 50 knots. No matter how I recalculated my course, I was scheduled to arrive at the Cape no sooner than 00:00 (midnight) while the winds were forecast to kick up between 01:00 and 03:00. To make things worse, every forecasted wind and pressure change along the way occurred just as predicted, so there was little use in hoping the forecast was wrong. Any delay in my passage would mean sailing through 50 knot winds. Some of you know about winds and wind strengths, while others don’t. An example of a good sailing day would be 10-15 knot winds – nice and comfortable going. A fun and exhilarating day would be 20 knots. 25 is going to be a bit sporting, and only enjoyable by experienced sailor. 30 is just plain hard work for any sailors, experienced or not. At 40 knots there is little pleasure…and at 50 there is no god. So…the thought of rounding Cape Finisterre with its treacherous reefs in such winds, was not something I wanted to experience. (Back again…) Well, it’s now Saturday morning and I can say that last night was one of the most beautiful sails I’ve had in a long while. Otto (that would be my autopilot) and I worked our tails off steering and driving the boat for every second of time we could, and we arrived just west of Cape Finisterre at 23:30 in dark of night, gybing into the separation lanes. There is a lot of shipping that travels around the Cape back and forth from the Mediterranean and Africa, and so they have marked lanes to control the direction of traffic. We gybed down through the lanes and exited them at 01:30 and made an angle of sail towards Vigo, a town on the coast of Spain. Once in that area, we’d be sheltered from the worst of the winds, by cover of the coastline. About 30 minutes after we gybed for Vigo, the predicted winds arrived – quickly rising to 30+ knots. Fortunately, just before 23:00 I had the foresight to reef the mainsail and Solent jib – (reefing is making the sail smaller in size by gathering some of it and tightening it into a “reef.”) Once I found just the right angle and balance of sail trim, Bodacious Dream took off in a way…I can only call mystical…a quiet, fast reach. There was not much more sound than the whisper of the autopilot and the hissing of water passing the hull. We were traveling at 16 to 18 knots down waves. When you have a boat as beautifully designed and implemented as the Kiwi 40 Bodacious Dream, and when you set her just right…that’s what she does. Fast speeds with very little noise, noise being an indicator of drag. I sat back and marveled at how smoothly and quietly she was sailing, and how lucky I was to have a boat that could handle 30 knots of wind with such class. As if that wasn’t enough, shortly after the winds came, the skies cleared and the bright moon appeared casting soft glows across the wild waters. It reminded me of fractured black glass…the broken edges glistening in the moonlight, as we rolled over each wave. Even more fortunate was that this moment lasted for another six hours, as we made our way to the Vigo area. Once there about daybreak, we turned down coast, and will spend the rest of today and tonight, making our way to Lisbon, about 200 miles south. Oh…and still one MORE thing. Not long after the moon set and the skies went dark, a school of porpoise came by to play. The water was full of phosphorescent plankton, and the wakes of the speedy little guys and the tunnels through which they sped around and under the boat, were all aglow in the dark. Some corkscrewed, some just went in straight zips, like contrails – but all of it was wonderful. So it was, that while the winds did come, and we were ahead of them enough to escape their full force, in the end, we were doubly blessed with a magical night of sailing. “Well … just been a day of wishing for more wind and motor sailing along. It’s actually been quite nice out – warm and sunny, but the wind has been light and from astern, so I’m using the added push of the engine to keep the speed up. All is well though. 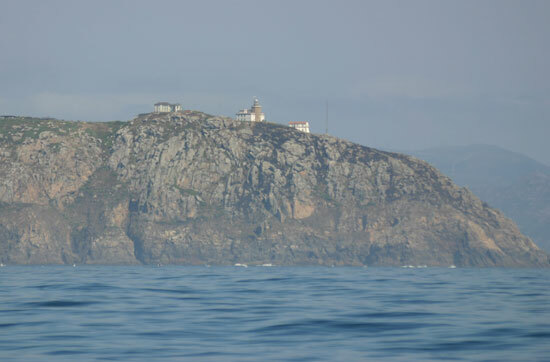 At this point, I’m just past halfway across the Bay of Biscay, headed to Cape Finisterre … one of the famous places along the way. From there, it’s another 300 miles south to Lisbon. So … for now, 200 miles down, 500 miles left to go. Also, the computer seems to not want to receive emails at the moment, so I’m a bit hampered by that. I don’t really know why or what to do about it, but thanks to the satellite phone, I’m able to call the weather folks and keep abreast of the coming changes. There should be good winds coming tonight that will move me more quickly towards the Cape. At that point, I will have to negotiate rounding that cape in a breezy condition. Once around, and down about 100 miles, the winds will probably go light again.They say that Saturday afternoon on to Sunday’s arrival will be light sailing again. Oh well. Just hoping I have enough fuel … once again! Things are always changing, not the least of which are the winds and the weather!! One of the most dynamic parts of sailing is having to carefully and efficiently weave your way through ever-shifting weather, winds and tides. As of the end of last week, we were looking at a rather open opportunity to leave La Rochelle and head southwest to the Azores, before continuing south to pick up the trade winds and sail for the East Coast of North America. Since then however, two developing low-pressure systems have positioned themselves directly in the route, and have left no other alternative passage around or through them. Well, there IS a route open over the top of them, going up to 50˚N. This more northern route however is not typically considered safe this time of year, because of the rugged weather systems that march across, but it looked like a possibility for a time. Overall, this route comes with greater risk, as you can only see predictable weather for seven days – and at seven days, I’d be smack in the middle of the route, and any change in direction of one of the low-pressure systems, would have a significant impact on the navigable weather. Below is what the weather forecast looks like in the mid-Atlantic for next Tuesday. Bodacious Dream would have been at about the eastern edge of the eastern stormfront. The brighter the color, the more intense the low pressure and winds. The site this is taken from – www.passageweather.com – is an interesting site to view, if you’re at all geeky about sailing and weather. So, we have gone to another plan, and that is to sail south to Lisbon, Portugal and store the boat there until December 1st, and then look for a good weather window to leave from there. Why go to Lisbon? Well, La Rochelle is located on the infamous Bay of Biscay, a place where bad weather gets progressively worse this time of year. Right now, we still have a good weather window to leave La Rochelle that will last for only another 4 to 5 days, and that’s enough time for Bodacious Dream to sail south from La Rochelle and get to Lisbon on the edge of the trade winds. It will be easier and much more likely for us to find a weather window from Lisbon in December than it will be from La Rochelle. So, while it isn’t a significant or even desirable move forward, it clearly is in terms of meeting up with favorable weather, which is something we must always try to do. So, this will be about a four-day trip south to Portugal. I’ll see what I can do to keep you informed with short updates. It will be an interesting trip in that it traverses the Bay of Biscay, and then around Cape Finisterre, two of the more famous sailing regions to add to the list of notable areas we’ve sailed past this season. So, by the time you receive this, Bodacious Dream will have slipped her mooring lines, and headed off once again. We will miss France and all the good people we’ve had the pleasure to meet and to exchange laughter with … over mispronounced words. Many thanks to all of you here in France who have made my and the BD crew’s visit so special. I’ve enjoyed our times on the boat, sharing stories and dreams, and I look forward to returning and sailing with you all again in the future. 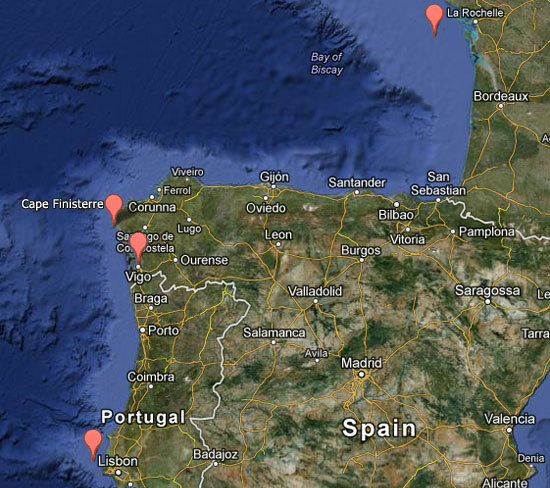 And now onto Portugal … hmmm, wonder what chocolate-flavored breakfast treats they have there?!! BoDream News/ T-Minus 4 Days Til’ Departure! I’m back in La Rochelle, France after a short holiday in London and Ireland. Had the great opportunity to meet up with the London Office of William Blair, and share some stories. Great folks there, and one fun story to share … a typical Rearick story! The plan was to meet at HIX Restaurant in the SoHo district, and I arrived a bit late after a couple of twists and turns on the subway (called the “tube” in London.) I explained to the hostess that I was meeting a group for dinner and she, without any hesitation, pointed me to the room down the stairs. I walked down and into a room full of suits and ties, and figured I was in the right place. Though I didn’t recognize anyone, I heard talk in the background of financial market conditions, and so I relaxed, ordered a beer and began to circulate. After a few minutes of conversation with one group of guys … (of course, you can imagine I wasn’t really dressed the part) … I finally thought to ask if this was in fact, the William Blair party. After a good chuckle, we figured out I was at the wrong party, though curiously enough, this firm does business with William Blair – so all was good. I excused myself, thanked them for my beer and went in search of my party. When I arrived at the proper table, beer in hand, they all knew where I’d been, as they had watched me walk in and disappear down the stairs. Well, what good would a sailor be, if he couldn’t walk into a strange party, tell a good story and get a free beer? In London, I got a chance to take in some of the high points, especially the Maritime Museum in Greenwich. 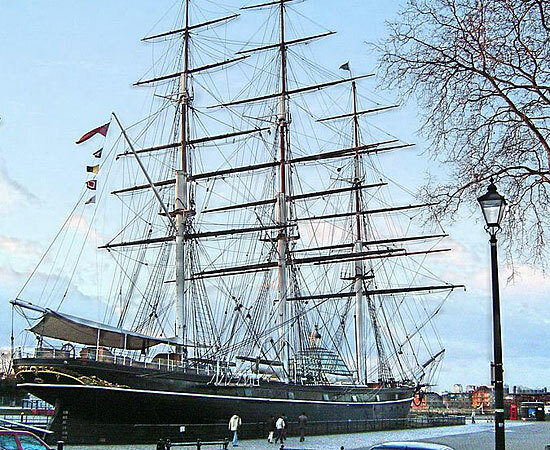 What an interesting place to visit, complete with the famous Cutty Sark heself, outside “on the hard.” The Cutty Sark, a clipper ship of the tea trading days, which long held the speed record of 73 days for its outbound passage from London to Australia back in 1874. From London, I took a train and then a ferry to Dublin and spent a couple of days drenching myself in Irish culture and music. Way too short a time to spend, but circumstances being what they are, it was all I had, and a bit was a whole lot better than none at all. So, now I’m back in La Rochelle, where it’s still raining. 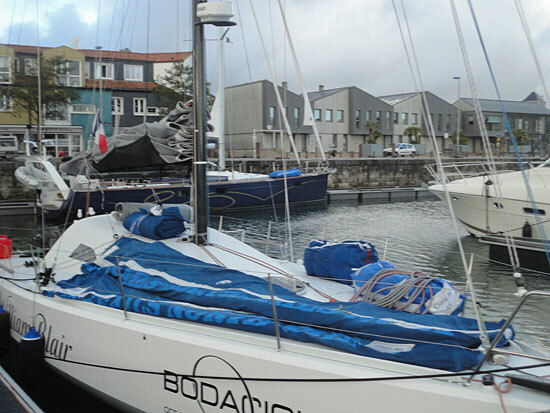 Bodacious Dream has been drying out and being looked after by good friends Pat and Michelle of the Croix du Sud, who are also planning on competing in the Global Ocean Race as a double-handed team. I’ll be spending the next couple of days doing the last minute preparations necessary before leaving La Rochelle and France, and then sailing for home on Wednesday. Jobs will include provisioning, water, sorting and packing, weather routing and maintenance. Fellow sailor with Bodacious Racing, John Hosking has been keeping track of the weather and providing routing guidance for the trip back. So far, it looks like a decent start to the trip, but after a week or so, it gets a bit confusing with a few lows building and moving into my desired path. As you may know, low pressure systems are typically the systems that bring stormy wind and rain. Finding a route between them that still sustains good winds is what we call routing. It will be interesting to see how the whole weather systems play out, as the typical Atlantic weather is somewhat mixed up at the moment. There is an old saying—“Sail south until the butter melts, and then head west with the tradewinds.” The trade winds are steady winds that blow in consistent directions through the tropical zones. These winds blow from the East toward North America in this area of the Atlantic, and so provided good sailing for the old trading vessels like the Cutty Sark … hence the name Trade Winds! Here’s what our computer routing programs look like to us. The black line is the course to the Azores, south west of France. The Red line is one route by the computer, the blue line another. They are determined by computer weather models. The various shades of color represent wind strengths … blues being lighter, greens to yellows being heavier. The wind strengths are represented by the “flag” type symbols. You can see that some have one “feather” on them, while others have one and a half or two. Each full feather is 10 knots of wind, a half is 5 knots. So, a feather and a half is 15 knots, two feathers is 20 knots. If you think of it as the feather on the back of an arrow, that is the direction of the wind. So, just a few more days here in France. This afternoon, since it’s Sunday and most of France takes Sundays off, I’m going to try to make some time to travel north to the seaside town of Les Sables-d’Olonne, where the Vendée Global Race is scheduled to begin on November 10th. The Vendée Globe, begun in 1989, is the evolved version of the Golden Globe Race of 1968 when the first person, Robin Knox-Johnston, sailed his boat non-stop around the world in about 312 days. Nowadays, the race is filled with state-of-the-art, carbon fiber Open 60 sailing machines, each still manned by just one person, with the goal of racing around the world nonstop. The winners in this race typically take less than 90 days for the passage. The Vendée Globe, like the Global Ocean Race and the Velux 5 Oceans Race, are the premier solo world circumnavigation events. There’s always a lot of discussion as to what would be harder … non-stop or stops in a circumnavigation. What would you think? Some say non-stop … some say stopping. With non-stop, once you build your lead, your strategy is just to stay ahead and not break anything. In the stopped version, you restart even at each port. Each leg then is a new race, and so you sail with a different strategy. Interesting question isn’t it? No doubt, 90 to 100 days, constantly racing your 60 foot boat is a great test of human endurance and fortitude. Check out progress on the Vendée Globe at www.vendeeglobe.org. Well, enjoy your day. I’ll send out one more update before I depart on Wednesday. Then I’ll be relying again on my friends at Firm Solutions to help forward news of my passage to you through these newsletters, the BD website and Facebook. My plan is to send out news along the route through our onboard satellite communication system – hopefully! It’s Thursday afternoon, as I write this. The Mondial Worlds ended Saturday night, five days ago, and it’s only stopped raining for a few moments since then. Most of the crews left Sunday, and their boats followed shortly thereafter. It being early fall here in La Rochelle, the energy about town has quieted from a month ago when I first arrived. Some of the restaurants have even begun to help me reintegrate into the American life I’m headed back to, by closing early… around 9:30pm!! I had grown accustomed to grabbing something to eat at very late hours. It’s time now to sort and pack the boat, and get ready to leave myself. Being a traveling sailing program, I’ve acquired many things over the summer – from all sorts of extra gear to new electric tools, due to the different electrical system over here. The race sponsors help arrange storage and moving of gear from one port to another by truck or container – which helps for racing, but since I’m sailing home, much of the gear needs to come with me. Here in La Rochelle, I emptied the contents of the boat into a storage locker, and am now retrieving everything including some things I’ve acquired since the races… like bottles of French Red Wine!! On Monday, with it still raining, and before beginning to repack, I took the time to wash out the boat from one end to the other. 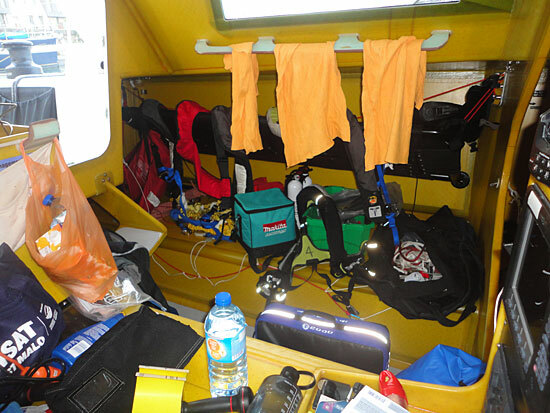 The rain keeps coming, so the inside is still struggling to dry, while I keep bringing stuff onboard that’s gotten soaked between the car and the boat. Good thing the dehumidifier is less than a year old. The other task at hand is to set up sails for the trans-Atlantic sail home. The mainsail is up at this point, and I have two jibs I have yet to set up. Whenever the rain stops for a moment, I’m going to take care of that. Sails and The Lady in Waiting.. This push to get the boat ready, is also to give me a chance to leave here this weekend, and to take in some touring of London and Ireland. I hope when I return, that the weather will have changed, at which point, I can do some quick shopping for food, say some goodbyes to friends, untie the dock lines and point the bow west and head for home. This trip will be a solo trip all the way – partly for training purposes, partly to qualify for the Global Ocean Race and partly just for myself. My solo dreams of long ago began with reading about those who sailed solo across the Atlantic. It will be a real treat for me to retell those stories in my memory, as I sail the 3500-4000 miles from La Rochelle to Charleston, SC. There are two schools of thought when it comes to sailing from France west to North America. Many of the boats this time of year are headed more south than I am, to the Caribbean for the winter. In that case, they will likely sail south to the Canary Islands and Madeira, before hooking onto the trade winds and sailing west. That trip is approximately 4500 miles long. I hope to find a weather window that allows me to sail to the Azores, and then across, which shortens the route by 1000 miles, but also comes with the threat of heavier low pressure systems which may mean lighter or no wind days. Using Google Maps to Get to the New World.. But the first goal of this trip is to get clear of nearby Bay of Biscay and then past Cape Finisterre, at the northern tip of Spain. It’s a toss-up, but some recent looks at the weather pattern, suggest I might get the weather needed. For the next week though, predictions are for a rather intense low pressure system which could bring wind and rain to the area. That makes it a good time to head to Ireland, and hopefully find some great Irish music and learn a wee bit about the country. So, one last adventure to be had – Ireland and London – before heading for North America, hopefully Charleston, SC – or else, somewhere in Florida. From there, I will begin the ramp up in preparations for the Global Ocean Race, which starts about a year from now. There are lots of things to do to make the boat ready, and that will take up my winter, and then come spring – lots of sailing solo to train for the race. I’ll pass along another quick update before I leave France, and then hopefully, there will be some updates along the way as I head west. Until then, if you’re in the Northern Hemisphere, enjoy the fall weather, and if you’re in the Southern Hemisphere, spring is here and summer isn’t far behind!! Posted in Captain's BLOG, Dave Rearick, International Races 2012, Mondial Class 40 World Championships. BoDream News/ Around the Last Mark..
Well… a tough day on the water, for sure. With a regatta like this, such top-level competition and an “all in” attitude, you stand to either win or lose a lot. We started the day in fifth place… a point or two behind one tough competitor and a couple of points ahead of another. We didn’t come to do “just ok,” so we showed up today to race hard, take all the chances necessary and hope, when we had our bets placed, our cards would come up the way we wanted. In a regatta like this, on the final day, the leaders take few chances and try to retain their lead, and those behind, pull out all the stops and take all the risk. So, what’s to lose in moving from fifth to something less, compared with what’s to gain in moving from fifth to third maybe? So, first race, we came at ‘em. Hard-pressed on the line for a great start, but you can’t be over the line before the start gun – so the trick is to try to hit the line with great speed just at the time the gun goes off. If you’re a second early, you have to go around – which is what happened to us. Unfortunately, that second early cost us about three minutes, as we had to turn around and restart… essentially giving everyone else a head start. Three minutes later, we were back, hard at work trying to make up ground and we did. We made up a lot of ground, but… ran out of runway as they say. In the end, we took a tenth I think, and so lost points to our previously trailing competitor. Determined to do better in the second race, we pulled out our upwind code zero at the start and led the fleet to the first mark – first around… downwind to the second mark, at which point the winds began to die a bit and to shift abruptly. We were able to stay very close while rounding the second mark… but in the next upwind leg, the winds took a 50 degree shift away from our covering position, and that cost us dearly. We went from second or third to somewhere around twelfth, in a matter of a few minutes. I’d have to show you how that works on paper, but it works and it’s a really hard pill to swallow when it happens to you. We worked back a few places, but THEN it got exciting!! Coming into the last mark before heading into the short distance to the finish, we came shoulder to shoulder with another competitor. There are some rather complicated rules in sailboat racing, and one of them is a rule about two boats being overlapped at a mark rounding. If that’s the case, the outside boat has to give the inside boat room to round the mark. We came in as the inside boat… requesting room to round the mark, but the other boat contested our overlap and refused to give us room. With nowhere to go, our two boats each holding steadfast to their beliefs, came side-by-side with each other and collided! Needless to say, there was a lot of contention as to who was right. Fortunately for us, there were two jury boats close by to witness the incident, and they confirmed our “rights” with regard to the rules. Pretty exciting, but nobody wins anything this way… so while other boats slip past, you’re left to untangle boats, rigs and egos. Third race – at this point, with nothing left to lose, we took off with every intention of taking home another first. Unfortunately, the shifting winds did a similar thing to us once again, and our “all in” bets were lost. We rounded the first mark in an embarrassing last place… but we worked hard and finished back in the middle… but, that was also the end of the regatta, and when the final totals were made… we ended up in 10th place. Still, I remind myself that these are fortunate days, exciting experiences and exceptional people to be sharing them with. If you write it out… tenth in the world doesn’t look so bad, does it? Well… nonetheless… this has been one of the great regatta’s I’ve ever had the chance to sail. 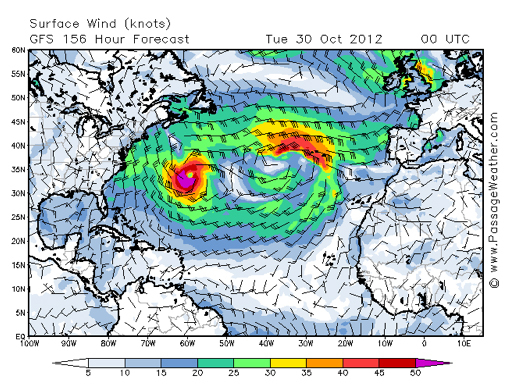 Next up is a bit of time to put the boat back into offshore condition, and then head for home… North America, that is. I’ll send an update soon as to the plan to sail for home – solo – across the Atlantic, and be home in time for Thanksgiving!! Thanks for hanging with us through all this. it means a lot to all of us. 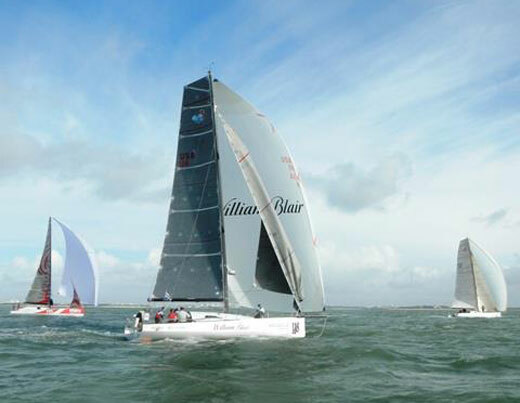 Posted in Captain's BLOG, Dave Rearick, Email Newsletters, International Races 2012, Mondial Class 40 World Championships. BoDream News/ A Wire 2 Wire Win! Class 40 Worlds: Day Two.. This morning came on rather harsh. Winds were up to 30 knots as we left the harbor under a solid rain. With the schedule of the locks and tides, we were concerned that they might get us out there, and then not be able to hold a race because of the conditions – but all went smoothly; we cleared the harbor, again pre-dawn, and got the day underway. This morning came on rather harsh. Winds were up to 30 knots as we left the harbor under a solid rain. With the schedule of the locks and tides, we were concerned that they might get us out there, and then not be able to hold a race because of the conditions – but all went smoothly; we cleared the harbor, again pre-dawn, and got the day underway. Race One was a distance race that kept us on our toes. The initial information on the racecourse was that it would be the same one as yesterday – so we set up all the navigation necessary under that information. At the last minute, before the starting sequence, they changed the course to an entirely different one that sent me scrambling to work out the new set of angles and winds. At the same time that we were tacking, we were also putting on and transferring the water ballast, which left the guys up on deck working like mad to sail the boat! We had a great start and held our own with the leaders, but on the third leg, had a bad reach plan and lost a number of places. The guys just dug in, and as they say in New Zealand, “grunted it out” and we worked our way back into sixth place by the finish. By the time of the Second Race, the winds scaled back and down to about 12 knots. The race committee called for a windward/leeward or as they say in France, a “banana course.” We got off to another good start on this, but missed a shift sequence, and so fell a bit behind. Then the wind shut down to single digits, and they shortened the course, before we had a chance to work our way back out of the corner we were in. Not even sure any of us kept track of how far back we were on that little go-round. Zigging and Zagging in Traffic.. In Race Three, we were determined to make a difference. We got up there in the start while the other leaders fought for the other end of the starting line. We hooked into the proper shift sequence, and made huge gains on the other boats, all the while sailing faster and higher in the water. We were really feeling like our systems were clicking, and the boat was responding beautifully. We rounded the first mark ahead of everyone, and from there on; we were able to hold that lead all the way to the finish! A great win for the crew, and a convincing one at that! Back at it tomorrow, early pre-dawn again. The weather is questionable with a forecast for lighter winds, but our hope is for a sea breeze fill in the afternoon, which will allow us to get in some more good racing. The guys are really great people to sail with, and they don’t let disappointments get them down… they just keep going right after the rest of the fleet, picking them off one by one as they can. More tomorrow. Thanks for keeping tabs on us. BoDream News/ It Begins with a Bang! Wow… what a great day of racing!! 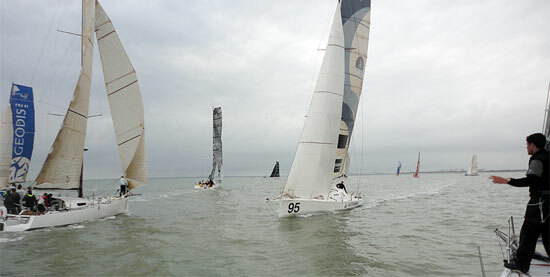 With 18 boats in the event, the racing is extremely top-notch and in very close quarters. It’s been totally full on from the starting gun through to the end of today’s races, with leads changing all the time. We left the dock at 7:15 this morning just before sunrise, because of the tides and the lock/harbor entrance schedules. The first race went off at 9:00 am. There was a slight time delay, but as the starting sequence of five minutes began, the boats began to work out their starting strategies and positions. The way sail races begin is with a five-minute countdown… you can’t cross the starting line until the gun goes off at the end of the five-minute countdown… so you try to position your boat so it’s at full speed to take maximum advantage of the winds and smoothly hit the timing of the start. We started at the front of the pack, but quickly enough there was a general recall… meaning the line judge wasn’t able to see all the boats clearly, and so they restarted the race. On the second start, we were in an equally perfectly position with a clear lane for a fast start. We held our position and were the second boat around the first mark… working hard with winds in the high teens and low twenties. We went back and forth with the leaders the whole time, but ended up in fifth position just a boat length behind Mare – one of the race favorites, but all of the boats were very close in their finishes. The second race was a long distance harbor race with 7 marks and about 25 miles to the finish. Again, we started strong and held onto a top position working our way up to third rounding the last mark. Confused by the translated sailing instructions, we misunderstood which mark would be used for the finish, and hoisted our A3 spinnaker, when we should have used our A4. With the boats as close as they were, this miscalculation cost us three positions, and so we ended up that race in sixth position. Though we weren’t up front, our finishes were still quite respectable within the fleet of 17 boats. It was a day of great sailing and of demanding performances under a variety of conditions. One leg across the harbor at 8 miles long went by so quickly, it was almost a shame. With Bodacious Dream skipping through French waters at speeds between 17 and 21 knots, it only took 20 some minutes!! All in all, it was a great thrill, and we are all very excited about racing again tomorrow. Given this was our first time racing as a crew, and that we only had a couple of quick hour-long practices, we are confident we will continue to get better as the regatta continues. And I have to say, what a thoroughly great group of guys to sail with – happy, fun, energetic and excited to be taking part in a World Championship. We’ll continue to try to bring you updates from the water as best we can. Until then… time for some much needed rest before the pre-dawn boat call tomorrow. P.S. In addition to our own BoDream Facebook Page, the Class 40 Association has a Facebook page too, which while it is in French, looks like it will have lots of photos. We’ll pull the best ones… (i.e. the ones of BoDream anyway!) and post them on our FB page. La Rochelle, France where the Class 40 World Championships is 7 hours ahead of U.S. Central Time – so, as this is posted, it is 7:45 pm in France. Below are the live messages sent during our night from Dave during Day One races. Day One: Hour 4: Great first event. Tight group among the top five. We were fifth, but only one boat length behind Mare in fourth, and maybe five boat lengths total difference between second and fifth places. We’re feeling good! Day One: Hour 9: Great second race. 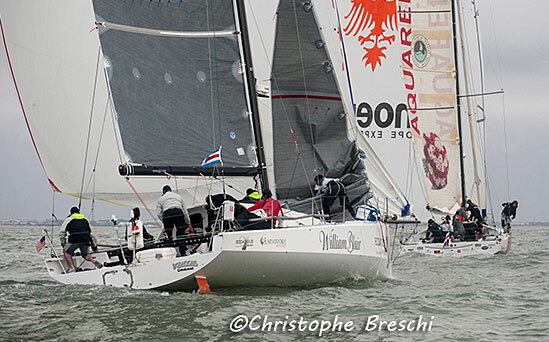 We were in good position for a podium finish, but we used the a3 spinnaker instead of the a4, and lost three places. We are in sixth position at present, but there are eighteen boats and we stay solid up front. Tomorrow will be great.